Cod has been Britain’s most popular fish for decades, only recently usurped by salmon as the nation’s favourite. Reports that there were only 100 adult North Sea cod left are misleading but cod remains vulnerable to overfishing. This doesn’t mean it can’t be enjoyed but try to buy sustainable fish such as line-caught Pacific cod, or fish with the Marine Stewardship Council (MSC) certificate. Or cast your net a little further – most methods for cooking cod work on similar white fish such as pollock, haddock or coley. Cod is usually available fresh or frozen in fillets or loins but can be bought whole or in steaks too. As with all fish, it is important to choose the freshest fish before buying. Fresh cod should be firm to the touch and free of an unpleasant fishy smell. In addition, whilst looking at the whole fish, the eyes should be clear and bright and the gills should be bright red. When choosing cod fillets, it is harder to tell how fresh the fish is – look for unblemished white flesh that is firm to the touch. Cod has a face only a mother could love but the white, firm flesh is succulent and delicious when cooked. The flavour is subtle and ever so slightly sweet and it’s a leaner option than salmon. Like all fish, cod should be cooked with care. Do not be afraid of undercooking the fish. Hold your nerve and you will be rewarded with flaky white flesh that still has a pleasant oily texture. Cod fillet is delicate but holds firm during cooking. Battered cod is one of the most popular dishes in Britain but it can also be pan-fried, roasted, poached, cooked en papillote or confited. If you are going to grill the fillet, put the skin-side down first and be aware that it breaks up quite easily so take care when flipping it over. 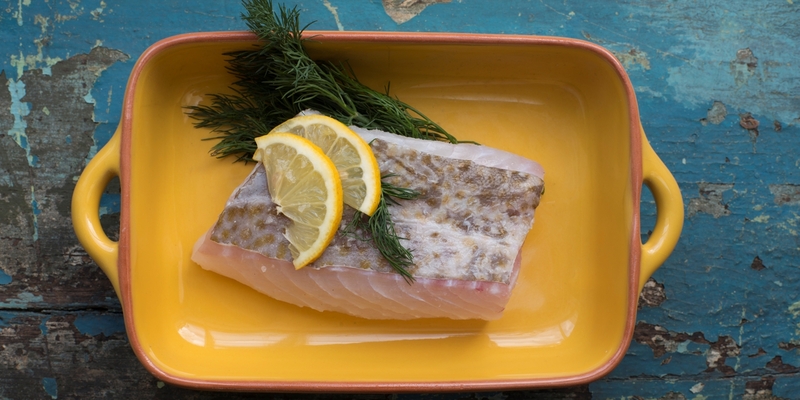 With its subtle flavour and firm, flaky texture, cod is a brilliantly versatile fish. The classic way of serving cod is in batter with chips and mushy peas but it is also the perfect choice for a fish pie or stew like bouillabaisse because it holds its shape when cooked and is complemented by rich sauces. Because cod tastes quite sweet, it pairs brilliantly with salty meat such as pork belly, chorizo, morcilla or pancetta. For similar reasons, cod can be marinated in soy sauce or served with an Asian-style broth. More traditionally, cod is served with buttery sauces as seen in Galton Blackiston's recipe for Roast cod with lemon beurre blanc and winter ratatouille and Mark Jordan's recipe for Fillet of Cod with poached hen's egg, crushed Jersey Royals and chive butter sauce. But cod also stands up well to the strong flavours and spices of Indian cooking – see Vineet Bhatia's Amritsari cod with garlic and green pea chutney or Tony Fleming's Spiced cod with curried cauliflower and mango for inspiration.